I am feeling a little better today, although I'm still moving pretty darn slow. Jerry has been a doll and is taking care of the ranch while I recuperate from Sunday's mishap. Since my chores are now minimal, I spent most of the day painting. I am 2/3 of the way through my color studies for Father O. and I am fairly satisfied with how they are turning out. That's a good thing. Perhaps I am starting to see some light at the end of my long commission tunnel. I've been wanting to do a crow portrait as a part of my "Signs of Spring" series, so I also did this painting today. Our crows disappear over the winter. I don't know where they go. Crows don't migrate, but they sure don't stay around here. As soon as Spring rolls around, they all come back. We've got a dozen or so now and they really love to make a ruckus. I know some people don't like them because they eat other birds' eggs and offspring, but I like having them around, talking to me whenever I go outside. The spring colors you are using in this series are indeed magickal. I like the effect of these colors on the crows feathers. 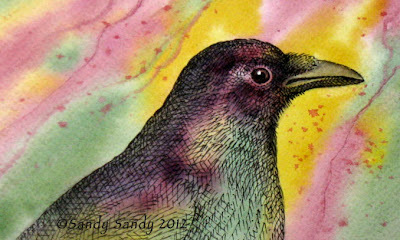 Irridescent with a mischievous sparkle in the crow's eye! Super! Love it! Th ink is a bit of a departure for you. I like crows and ravens too. They are difficult to photograph because they are too smart to let you get close. Thanks Denise! Crow's senses are keen for sure!